With a busy school schedule, who has time to meet a potential boyfriend or girlfriend? Speed dating might be the easiest and fastest way for students to get a date. 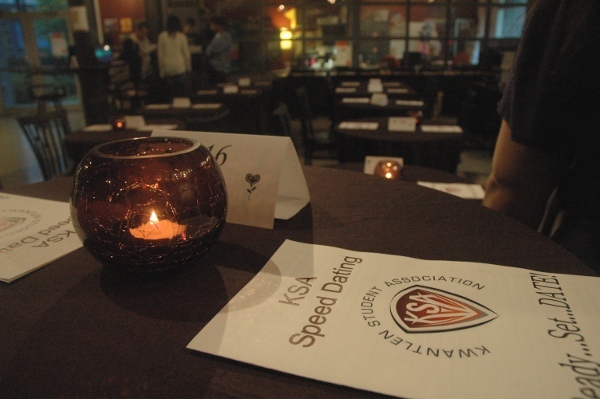 The KSA’s speed dating event took place on Oct. 21 at the Grassroots Cafe at the Surrey campus. Female and male students went out to participate, to meet new people and maybe even get a date. It turned out to be so popular that the Kwantlen Student Association had to put a few names on a waiting list for future events. However, some KSA members had to fill in for the registrants who got cold feet and never showed up. “There was supposed to be 20 [participants]. Twenty guys, 20 girls, but only half showed up. We’re thinking for next year to maybe do a $5 deposit. There were a lot of people on the waiting list that wanted to [come] but we weren’t able to tell them because we thought everyone was going to show up,” Bali said. The event started with an ice-breaker activity before participants took to the tables to start off five-minute conversations. After five minutes were up, the men would move to meet another woman at the next table. Before the event started, some students opened up right before their first experience with speed dating. Manpreet Uppal, a third-year nursing student, was also excited and nervous. “This is just for fun, to do something different. I’ve never done it before. I wanted to do it last year, but I think it didn’t go with my school schedule and today it did. I am nervous now,” she said. The next speed dating event is scheduled for Feb. 10, 2011. For more information, visit the KSA website. RELATED: A personal take on the speed-dating experience.